Eleanor is an epic dramatic musical that traces the life of Eleanor Roosevelt and her relationship with Franklin. The piece interweaves personal history with social history, revealing the profound influence Eleanor had on Franklin's political and social ideas. My choreographic assignment was broad and challenging, from big musical numbers to intimate musical momentsa total of 23. Director Lisa Portes and I worked to find the seamless balance between dramatic scenes and musical stagingshaping dramatic action in the musical numbers and integrating subtle staging into the scenes. 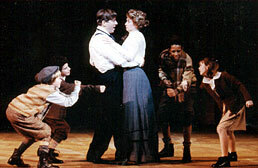 My personal highlights included an enormous 1902 Assembly Ball scene complete with lavish waltz and the quick-stepping ragtime number, "New Century Walk"; the humorous, character-based musical numbers "Practical Politics " (with Franklin and Howe on the campaign trail) and "Nothing in Particular" (with Franklin and drinking buddies fishing on his houseboat); "Foggy Bottom" which examined the stress of the Washington life on Franklin and Eleanor's intimate relationship (choreographed with moving tableaux of the complex Washington political and social scene); and "Fun" in which Eleanor slowly discovers her public speaking prowess as she stumps across the country for her incapacitated husband. 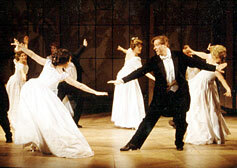 A videotape of Eleanor: An American Love Story can be viewed at the Lincoln Center Library of Performing Arts in New York City. 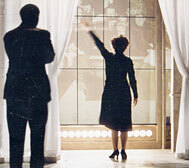 To make a viewing appointment, call the Theater on Film and Tape Archive at 212-870-1642.